Farragut Storage offers you the security you're looking for in a top quality storage facility. On site resident managers Gary and Cyndi are there to not only keep a constant eye on your property but have full surveillance cameras at their finger tips. Farragut has been under the same ownership since 1994. 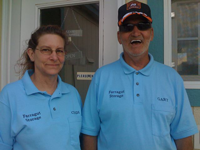 In addition, Gary and Cyndi bring their many years of experience with one goal in mind....make storing your valuable property at Farragut a very pleasant experience by offering you excellent customer service. They know it's not always convenient for you to get to the facility during regular business hours. That's why they're happy to offer you the added benefit of after hours access to your storage area by making prior arrangements with them. When you combine Gary & Cyndi's many years of experience, with their onsite resident presence, backed up by surveillance cameras, excellent customer management, competitive prices conveniently located on the way to Pend Oreille, Spirit Lake, Coeur d 'Alene or Bayview, it makes total sense to contact Farragut Storage for all of your storage needs. We invite you to call us at 208-683-2181 or fill out the "Contact Us" form on this web site. We'd love to go to work for you!